ESPN is reporting that Phil is gone. It's officially a "step down" rather than a "pack your stuff and leave." Presser is supposed to happen sometime later today. As for a replacement, I humbly suggest Kevin Ramsey. At least there's something to smile about today. More to follow. -- More from Volquest.com including these stats: "Sources indicated that Fulmer's fate had been sealed even before the team lost its 20th game since 2005. The Vols are just 3-9 in their last 12 against Alabama, Georgia and Florida. Further, against the Southeastern Conference's "Big 5" of Alabama, Auburn, Florida, Georgia and LSU they are just 12-21 since 2001." -- Tennessee has not launch a formal coaching search for head football coach since 1976, and they haven't been outside of the Vol Nation for a head coach since then either. Fulmer was on the coaching staff for Johnny Majors when Majors was fired. Majors, who was also a UT alum, started at Tennessee in 1977. -- The Vols have only hired outside of the SEC once since 1963. -- UT has only been without a UT alum as head coach for about 14 total years since General Neyland retired following the 1952 season. I am not sure how good this is for us, because my suspicion is that Cutcliffe is the natural successor for the job and he'd be a fool not to take it if it was offered to him. If that occurs, I'm fairly certain it won't be good for us. Yes, we handled him at Ole Miss, but relatively speaking his talent ceiling there was considerably less than it will be at UT. I'd much prefer a doddering Fulmer on the sideline for a couple more years while Cutcliffe built up enough of a resume to have a larger CFB power take him away from Duke rather than this. What does that say about us as a team and a fanbase that we would rather see a "doddering" Fulmer roam the sidelines than a smarter, better coach??? Why is Georgia now so soft and freaful? Why doesn't anyone fear us? And when is this going to change? If you don't know who Kevin Ramsey is, consider yourself lucky. Kevin Ramsey was UGA's defensive coordinator in '99. He came from UT. There was no single thing that got Donnan fired. But that was one of the two or three biggest things that ended his tenure. Anon: I am not sure how to take your comment. First off, I speak for myself, not any part of the Georgia fan base. It seems self-evident that teams have up and down cycles, usually connected to who their coach is. I don't think it's any accident that FSU and Tenn's declines in recent years have coincided with Richt keeping more Georgia players in-state. By the same token, Miami and FSU are being killed by the fact that Meyer is getting whomever he wants. UCLA can't get any LA talent at the moment because USC gets it all. Perhaps you would rather (hypothetically, of course) see Neyland coaching UT, Dye coaching Auburn, Bryant coaching 'Bama (and UK, for that matter), Vaught coaching Ole Miss, Holtz coaching Ark, Spurrier coaching Fla (and USC, of course), and Saban coaching LSU--and, what the hell, Heisman coaching GT, all of which would make it harder to beat them on a CFB Saturday, and many of whom would cut into our natural recruiting base--just so we could beat them all with less talent and prove our manhood. But that's not the best way to achieve success on the football field. Did you find this year's win over UT disappointing because their OC had left and they replaced him with an inferior model? Because I prefer what happened this year to what happened the two before it. He makes $1.5 million at Duke, and he has no meaningful pressure to win. He's 54 years old with a history of heart problems. If he takes the job at UT, he's an idiot. The extra $2 million that UT would pay him wouldn't do him much good in the grave. Also, depending on what you believe, Kevin Ramsey was fired at halftime of the '99 Auburn game after we were toasted like we've never been before. Then, maturely got in a fight with Donnan in his office a few days later. It could get worse than the Kevin Ramsey year followed by 2000, but I'm not sure how. 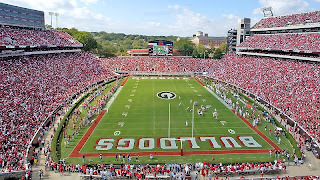 Granted Saturday was the worst loss of the Richt era (by far in my opinion), but lets all take a deep breath, look at UT's program and be glad UGA's program is in as good of shape as it is. That said, the talking heads on Rivals radio were discussing UGA in a similar light to Texas' purgatory (10 win seasons, no BCS championships) before 2005. Here's hoping our program gets that tough mentality required to become a top notch contender. The talent is here, the coaching staff is in place, the schemes (as much as we complain, arent entirely to blame for these brain fart halves of football) are good enough. Look in the mirror Dawgs. Sooner or later a senior class or group of leaders will help us make a "Boss Bailey-Pollack-Stinchcomb 2002" caliber program leap. Until then, we better get used to Tampa, Dallas and New Orleans when it doesnt matter. PWD: With all due respect, if Cutcliffe were overly worried about his health he would not be a football coach in any capacity. My guess is that he has enough money that he'd never have to work another day in his life if he so chose. So, in that respect I'd say you're right, insofar as I can't imagine that's what motivates him. But I'd guess what motivates him is that coaches want to win; specifically, college coaches want to win national championships. Cutcliffe can't do that at Duke, but he can do it at Tennessee. I can think of very few attractive coaches who have refused to step up at some point given the opportunity. Of the top of my head, I can only think of Edwards at BYU, and Beamer at VT. Edwards never would have left BYU, and Beamer, in essence, brought VT to the top of CFB. So neither really fits the example here. Even guys like Mason or Petrino turn down a bigger job one year, and then take a different one the next year. Cutcliffe may stay at Duke in the short term, but I can't imagine he'll stay there long, whether he takes the UT job or not. But, either way, it won't make him an idiot, but rather just a typical CFB coach. That was convincing. Sign me up, I'd much rather lose to a good UT team every year than beat a bad one. Well stated. I've asked you multiple times to either post your nonsense on AJC.com (where they inexplicably don't delete you) or start your own blog. I continually delete your stuff before almost anyone can read it. Do you honestly think that I don't recognize your non-sense just because you don't post your name? Solon - Sorry you had to read that silliness.